Root beer ice cream, macerated cherries, marscapone semifreddo; it's a trap. Canned sundaes. Could be a trap. Sounds a little too dreamy. Seems the man who gave the world Cronuts has another trick up his sleeve, tailormade for the hardworking holidayers of the Hamptons. The latest experiment from award-winning pastry chef Dominique Ansel, canned sundaes are making their way to New York's Hamptons this weekend to be sold in a fancy ol' truck outside Lisa Perry's East Hampton boutique. One-off Ansel desserts, Lisa Perry boutique. HAMPTONS REPRESENT. "Dominique was a perfect match for this collaboration, as both of our brands celebrate art, pop culture and fun," said Perry. "He infuses each of his confections with creativity and imagination and the end result is always a treat in more ways than one." Somewhat fancier than Burger King's bacon sundae and channelling the same respect for showstopping dessert flavours as Messina, Ansel has created quite the gourmet canned good in this want-now dessert. 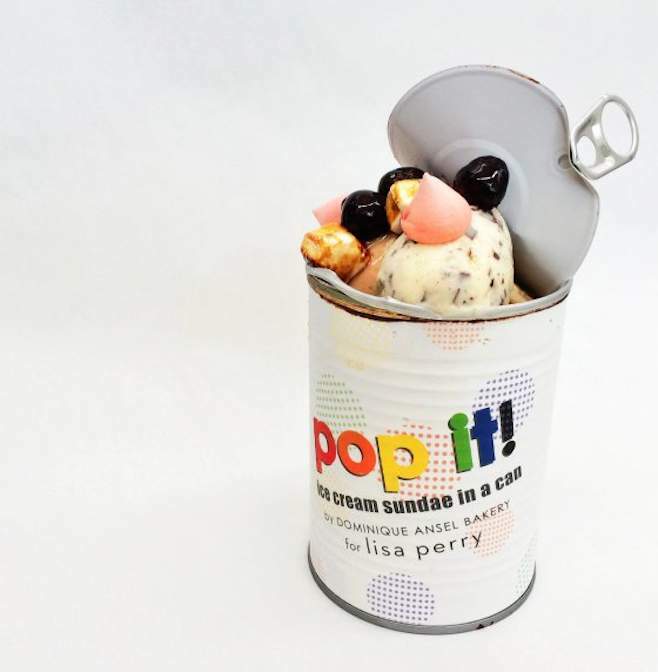 Inspired by Warhol's cans, the mash-up sundaes are based on the classic root beer float (apparently Perry's favourite) — with root beer-flavoured ice cream, stracciatella ice cream (vanilla and chocolate chips) macerated cherries and mascarpone semifreddo and toasted marshmallow hanging out in the can. On top, Ansel's tiny signature 'Mini Me' meringues. You could say it's the most decadent thing someone's put in a can since the Candwich (canned sandwich, obviously). Meant for sharing, the sundaes will set Hamptonites back $15 and have enough canned goodness for two dessert fiends. Ansel will only be serving up 500 of these babies, so watch the 'grams for bragging rights. But before you get all Gossip Girl hater over this decadent dessert stunt, it's for a good cause. Ansel is giving 20 percent of sales from his fancy, fancy treat to City Harvest. Whattaguy.